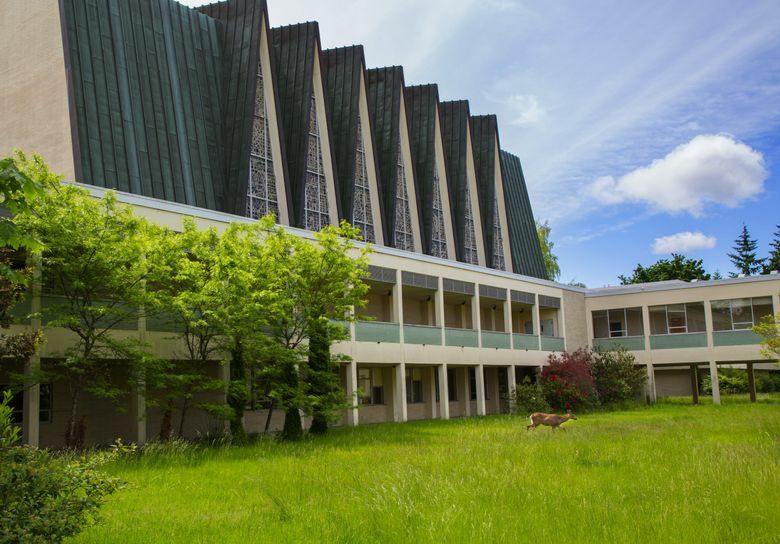 A Christian college built in Issaquah in the 1960s is on track for demolition, but the local historical society is appealing to save it. The debate revolves partly around a set of stained-glass windows in the chapel. James Colver points up ahead. “I proposed to her just up here,” he said. This Providence Heights campus was a Bible college in 2000 when Colver lived and studied here. It’s where he met his wife, Elizabeth, and married her in the campus’ chapel in 2002, under stained-glass windows depicting Jesus and Mary. “This is pretty much where I became an adult,” Colver said. The current owners of the property, The City Church of Kirkland, want to demolish the chapel and the surrounding campus and sell the property. But preservationists and community members like Colver, for whom the campus represents cultural and personal history, are appealing to the city of Issaquah to save it. Forty or so community members and advocates packedIssaquah City Hall on May 31 during a prehearing conference involving city officials and attorneys for The City Church and Sammamish Heritage Society. The heritage society is the main group working to save the college. A few at the conference had signs saying “Save Providence Heights.” In the weeks before the meeting, the city of Issaquah received more than 300 letters and emails from community members, according to Keith Niven, Issaquah’s economic and development services director. Niven estimated two-thirds advocated for saving the chapel’s stained-glass windows, one-fifth or so urged saving the entire campus, and others either supported demolition or spoke about what should replace the college. Providence Heights College was built in 1961 by the Sisters of Providence, a Catholic organization, to give nuns the same education opportunities as priests. It was among the first institutions of its kind in the United States at a time when feminism, the Vietnam War and the civil-rights movement divided the Catholic Church. The Sammamish Historical Society is applying to King County to have the campus designated as a historic landmark. Washington’s Department of Archaeology and Historic Preservation determined that the college is eligible for listing on the National Register of Historic Places, but it can’t be designated without the owners’ consent, said Jennifer Mortensen, an architectural historian at the Washington Trust. Niven argued that Providence Heights’ significance is debatable. The city has a listing of local “treasures,” but the college isn’t on that or any other list, he said. It’s also not part of any city-adopted plan for preservation, according to Niven. “I don’t have any reason not to approve the demo,” Niven said. When Providence Heights was built, Issaquah was a “hinterland,” Koler said. The city itself had less than 2,000 residents. The Sisters of Providence chose the site for its seclusion and built the campus with paths to places to pray and to complete the Stations of the Cross in the open air, according to Koler. But the college didn’t survive the turbulent 1960s, which saw thousands of nuns leave the Catholic church after the Vatican’s pushback against progressive reforms. In 1969 the college shut its doors, and the Sisters began renting it out as a religious conference center, according to the Sammamish Heritage Society. The Sisters sold the campus to the Lutheran Bible Institute of Seattle in 1978. Generations of Lutheran clergy and theologians from the 1980s to the 2000s studied and lived at the college. Colver began attending in 2000, with the intention of becoming a pastor; he has happy memories of water-balloon fights, lawnmower races and building playhouses for children who went to Noah’s Ark Preschool, which met on the premises. “I can almost hear the kids still playing in here,” Colver said. For Colver and the preservationists, the college has a lot of religious significance. 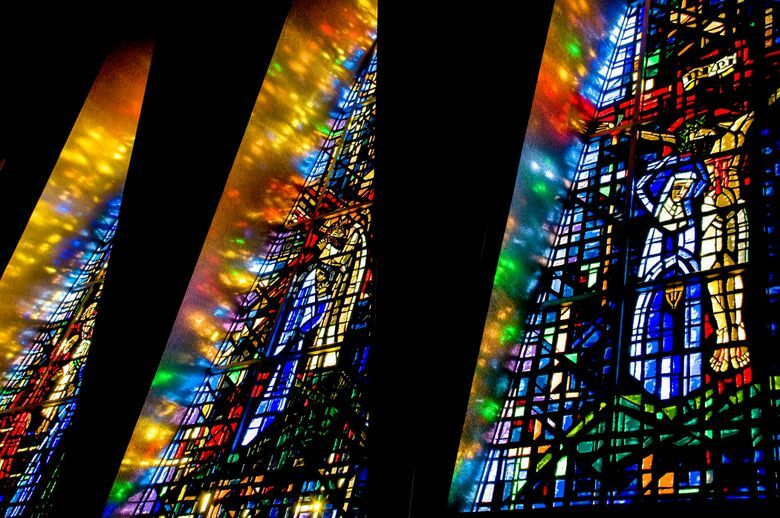 The windows in the chapel were designed by Gabriel Loire, whom historians call a world-renowned stained-glass artist whose windows can be found in the Salisbury Cathedral in England and Thanks-Giving Square in Dallas. The 14 windows in the chapel depict Jesus, the Virgin Mary and the Sisters of Providence. The City Church has agreed to remove the windows and return them to the Sisters, but advocates say the windows would be too hard to remove without damaging them. “It’s like the Sistine Chapel — you can’t just take a wrecking ball to the Sistine Chapel,” Colver said. In 2008 the property was sold to The City Church, one of the largest churches in King County, for $22.7 million. Today the property has a taxable value of $26.6 million, according to records of the King County assessor. The City Church and its attorney did not respond to requests for information or comment on the controversy. With demolition and sale, the property could go to the Issaquah School District for a new high school and elementary school. The School Board voted on the most preliminary part of that process — a resolution to condemn the property — last July. The Sammamish Heritage Society and the Washington Trust for Historic Preservation have been working to “throw a wrench” in The City Church’s demolition plan for a long time, according to Mortensen, the architectural historian. Because it’s a church that seeks the demolition, “the odds are a bit stacked against us,” Mortensen said. Properties owned by religious entities aren’t subject to landmark law in Washington. Still, the heritage society is trying. Besides appealing to the city of Issaquah to block demotion, it has applied to the King County Landmarks Commission to have the college locally designated as a historic landmark. A GoFundMe for lawyers’ fees for the heritage society has raised more than $3,000. At Wednesday’s meeting, advocates came away saying they’d bought time to organize and get the word out more widely. An appeal hearing, open to the public, will be held at 10 a.m. July 11 at Issaquah City Hall. “As long as it’s still standing, there’s a chance,” Mortensen said.